Well, dear friends and family in Christ, it truly is a beautiful Autumn time and season at Camp Del-Haven. The colors of the leaves are becoming magnificent! It is a wonderful testimony of the glory of our Lord. His handiwork is indeed marvelous to behold. Another wonderful and marvelous testimony of our Lord’s presence and answer to prayer is how it has been going for Jeff Hall and family in their moving on to the Camp Del-Haven grounds. While they still have quite a bit of work that absolutely needs to get done, they are officially moved into their new double wide mobile home. Praise the Lord! Please continue to pray for the leading of the Lord in meeting their needs and in giving them wisdom – as only He can do. In your praying for Del-Haven – Please remember to lift up in prayer our staff regulars who are facing the every day spiritual onslaughts of an alluring and compromising world, as well as all the snares of the Wicked One. These young men and women need the preserving grace of our Savior God to keep them and establish them in His righteousness. In short, they need all our prayers to support them in their walk through this fallen world. Please don’t forget that we need 5 good male helpers for next summer. And, when you pray – Please do not forget to pray for all the campers that God has delivered to Del-Haven to hear the pure truth of the gospel of His grace! We sometimes have a camper only once – and then we never see them again. Many times, however, we have camper boys and girls that start coming to camp when they are six years old and we see them every year until their twelfth birthday. It is from this group that we often have – by God’s grace – harvested good staff help. They are well acquainted with the Del-Haven program for evangelization and spiritual growth. But, in every case – Prayer for their true Christian walk through this world is an absolute must! This is where your support is so very important! Please continue to keep us lifted up before Christ’s ruling throne of grace and glory as often as the Holy Spirit moves you. We love you and thank you for doing so. You are so very important to us! Well, dear ones, we may finally be embarking on the pleasant, cooler days of Autumn. How refreshing that will be! Soon the campground will become aglow with all of God’s beautiful Fall colors of the forest leaves. It will be but another wonderful testimony of His matchless glory. The move of Jeff Hall and his family onto the campground is making good progress. Please continue to support them with your prayers and however else the Lord may lead you. If any of you have any questions – just call: (816) 277-7071. As always, please remember to pray for us – that our God would provide just the right male and female staff members. We especially need male help on our staff. The number of campers that we can handle depends directly to the number of good staff we have for any camp session. The effective ratio is typically one staff person per four campers. The Lord God knows what we need in order to do His work – and Camp Del-Haven is definitely His work! Also, dear family in Christ, please do not forget to lift up all the children that the Lord has sent to us as campers. They need our continual, faithful prayers that the Spirit of Christ will truly establish a true relationship with them – in their daily lives. Their neighborhoods; their homes; their schools – are fraught with the traps and snares of the Evil One and this world. There’s only one way that any of us can safely make it through this world – and that is by the leading and protection of the Holy Spirit of God! We pray for you-all – for your continual love and support – that our Lord will bless you and keep you – and that you will remember to pray for the boys and girls that God, through us, has planted the good seed of His glorious gospel. As it has before been stated: This ministry was founded on prayer – and has been sustained by prayer – and will only continue with prayer. We need your prayers! Thank you for being there. We love you all. Well, dear friends and family in Christ, we have completed yet another very blessed summer camp season here at Del-Haven. Our last older girls camp was a remarkable testimony of our Lord’s presence. Around the last campfire, several of the girls stated that their favorite time at camp was learning about the Lord at the Bible study time. Each year we give all the campers brand new Bibles. In fact, it’s safe to say that the two most mentioned favorite things are the food and the Bible studies…or, the physical meals and the spiritual meals. They all declared that they wanted to come back! Please continue to faithfully lift all the children up in your prayers. Please remember to seek the Lord with us concerning additional male help to be added on our staff for next year. It would be great to have five mature — dedicated to serve the Lord — young men on our staff for next summer. We need them for four camp sessions that would run from Monday through Thursday. Two for our camps for age 6 to 8 year old boys, and two for our camps for age 9 to 12 year old boys. Please pray with us concerning this matter. If you know of any young men – let’s say 14 years old, or older – that might like to do this – we would love to talk to them! Please give us a call: 816-690-8465, or 277-7071. On Saturday, the 18th – we had a wonderful “thank-you-celebration” for the men and women of First Baptist Church of Oak Grove – plus others — whom the Lord chose to help us with the renovation of our kitchen and restrooms, et. al. We had a blessed time of fellowship over hot dogs, hamburgers and ribs along with Theresa’s famous baked beans (well, they’re famous as far as I’m concerned) and her wonderful potato salad. It is a taste of heaven to sit around a feast table with, and among, the family of God! Thank you, Lord, for granting to us such good times! 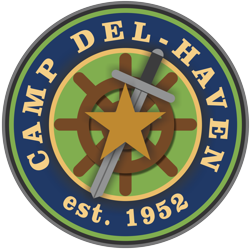 Well, dear friends, we are coming right up to the beginning of the 2018 Del-Haven Camp season! The Kitchen and Shower house/restrooms project still need some finishing touches to be totally ready. Please be in earnest prayer with us that these very much needed tasks are completed. With all the attention having to be given to getting our wiring updated and our Kitchen and Shower house/restrooms finished – we have at the same time a crisis situation where our staff is concerned. Many of our young people have reached the time when they need to seek gainful employment for themselves. This sort of thing happens. Therefore, we need your prayers that the Lord will provide ample replacements of young men and women who have a real desire to serve the Lord with us in proclaiming the gospel to the children that He sends to us. Everything about this ministry is supplied through faithful fervent prayer! Phil.4:6-7 encourages us in that it says: “Be careful for nothing – but in everything by prayer and supplication with thanksgiving – let your requests be made known unto God. (7) And the peace of God – which passeth all understanding – shall keep your hearts and minds through Christ Jesus.” What a wonderful promise! Thank you, Lord for giving that unto us! In all your praying for us, we would be remiss not to seek your prayers for the children themselves. Pray that the Holy Spirit go before us in preparing and paving the way for their hearts to receive the Word of the truth of the gospel. The apostle Paul, who never went to Colossae, wrote to them – seeking from them in Col.4:2-4 – that they “Continue in prayer, and watch in the same with thanksgiving; (3) withal [or, lit., at the same time] praying also for us that God would open unto us a door of utterance to speak the mystery of Christ…as I [or, we] ought to speak.” This is what it’s all about! May God our Savior grant us this earnest petition. The eternal salvation of souls is — wholly, wholly, wholly of the Lord!